"With your express interest in squadrons 1850 812 and the commissioning crew it has become a clique within the Association...." Incorrect. "Under the circumstances the committee have decided to withdraw your membership in the interest of the unity of the Association...." ?????? "He was requested to discontinue the sale of his own merchandise at future reunions...." Incorrect. "He was given the opportunity of selling his merchandise directly to the Association.... He declined this offer". Incorrect. 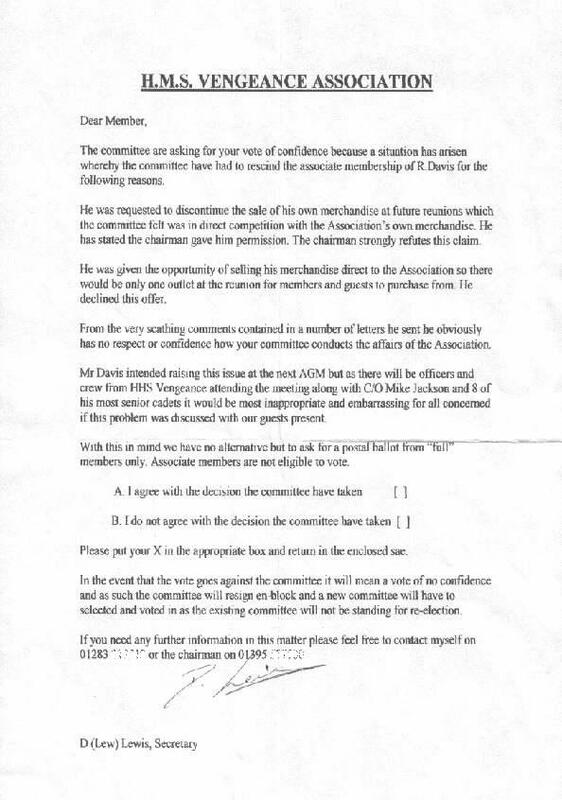 "From the very scathing comments contained in a number of letters, he sent he obviously has no respect or confidence how your committee conducts the affairs of the Association". Incorrect. The previous letters I have sent to the Chairman and Secretary (scathing comments?) are in answer to allegations put to me and I have addressed and answered these, asking some questions of my very own, to which I cannot obtain any answers, despite numerous requests. When I suggested that I would put these to the Committee and Membership at the 2007 A.G.M., I then received a letter notifying me of my suspension from the Association. How convenient? I have also requested a copy of the H.M.S. Vengeance Association Rules & Regulations, but have been advised by the Chairman that this manual does not exist. Therefore, as nothing is set down in writing, can the Committee can just make snap decisions without consulting or advising the membership? It appears that the Committee are resisting all efforts to give me a fair hearing at the 2007 A.G.M. by suspending me. They could also appear to be very embarrassed in front of the ship's company from the submarine and the T.S. Vengeance contingent, with such petty, frivolous, incorrect and contradictory charges. It is my understanding that any questions, problems or matters etc., arising within the Association should be dealt with at the A.G.M., where the members have a right to have their say and vote on appropriate issues. This certainly appears not to be the case here. Any member who wishes to see the full communicates and replies to the Chairman's and Secretary's letters, please contact me with your address details and I will forward photocopies to you so you can read and judge for yourself. 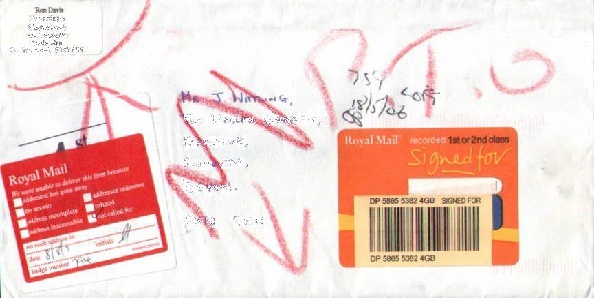 It appears that the Secretary must be getting worried, embarrassed or has something to hide as he is now refusing to accept his mail and is 'returning it to sender'. This does not bode well for a Secretary of an Association, who not only decides who will be members, but which letters he will receive also. 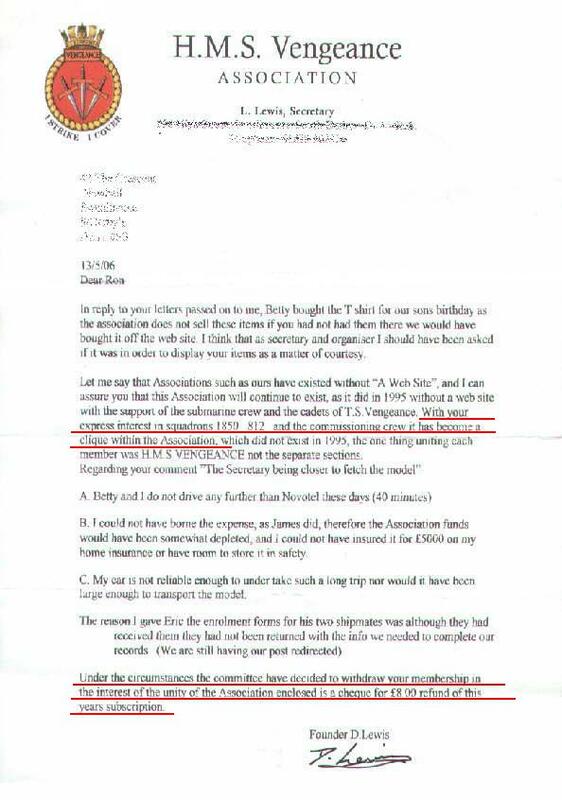 This actually proves that no-one will get a fair hearing or chance to have their say....even in a letter. Despite the Chairman's reluctance to accept the above letter, he did actually receive it again, disguised in one of his own, self addressed envelopes. Like the old saying, 'Where the is a will, there is a way'. The Chairman is also at the same game, in not collecting his mail from the Sorting Office after a card was left for him, advising that a Recorded Delivery letter was to be collected from his local office. Again, this does not look good for the Chairman of an Association, who as part of the Committee decides who will be members and who will not, also ensuring that no-one will have their say, if it differs from their own opinions. This obviously confirms the 'conspiracy' theory between both the Chairman and Secretary, of the Association. 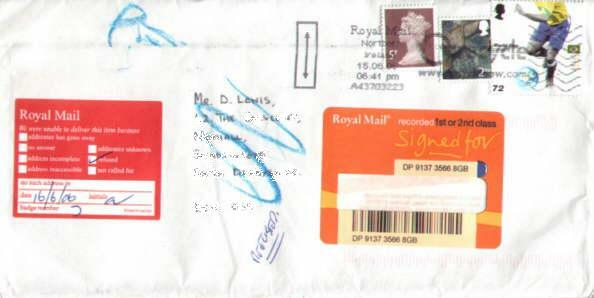 Note: For security reasons, addresses and phone numbers have been omitted from the materials.